Say so long to clunky, expensive & hard to assemble metal and wire cages to protect new seedlings. 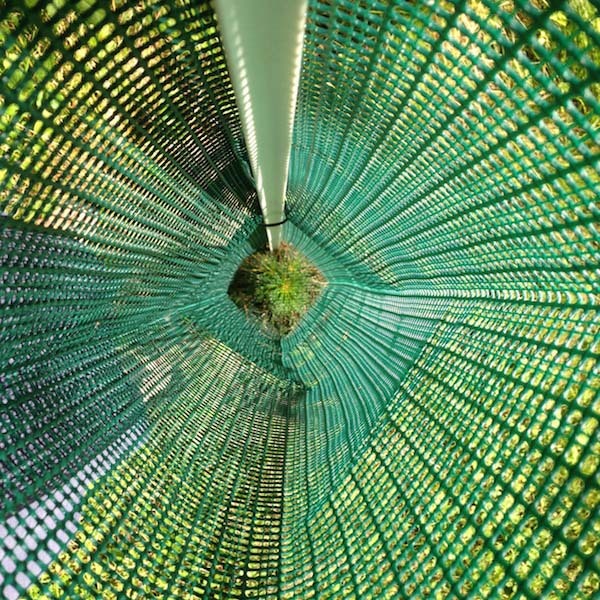 Plantra rigid mesh tubes for trees and shrubs are the answer to the frustration. Our rigid mesh tube protector line-up is engineered rugged with a welded plastic grid that keeps your seedlings safe inside and deer and rabbits outside! Green Color - Perfect for full sun conditions and is offered in a range of open diameter sizes from 7in to 18in. Green color is perfect for full sun conditions and a with wide range of tube diameters to choose from, there is sure to be a size just right for your planting stock. Choose either 5ft pre-cut length or 328ft bulk roll. Natural Color - Best for situations where maximum sunlight is needed including locations with partial sun - remember that young trees require 6-8 hours of full sun per day. 7in Open Diameter is best suited for narrow form trees. Choose either 5ft pre-cut length or 328ft bulk roll. 7 Inch Rigid Mesh Tube Size - Large tube diameter but with tight mesh designed to keep more buds inside the tube safe from animals. Perfect for use with narrower form evergreen trees (i.e. white pine and cedar) and deciduous (broad leaf) trees. 8, 12 & 18 Inch Rigid Mesh Tube Sizes Largest tube diameters with larger mesh size designed for wider form evergreen trees (i.e. spruce, red cedar, red pine), large-leaved deciduous (broad leaf) trees like black walnut and chestnut and all shrubs and garden plants. Keeping seedlings, shrubs and garden plants safe from animals with a mesh protector just got better! Plantra's line of rigid mesh tube protectors, screens out browsing animals that can kill your seedlings and garden plants. Engineered from rugged, u.v. resistant polymers, Rigid Mesh gets the job done in the field, in the yard and in the garden. Say good-bye to chicken-wire and other metal cages that are both expensive to make and even more expensive to buy. Say hello to fast, safe, seedling and plant protection that goes on easy and lasts until your plants are well on their way.